This is a delicious donut themed math center, focusing on missing addends. Students will use manipulatives to find the missing addend for sums of 10. Great practice for ways to make 10. This is appropriate for kindergarten and 1st grade, or any student that needs to work on missing addends. It is appropriate for the school and homeschool setting. It is great for special education instruction, because students use manipulatives to make learning concrete. Objective: Students will find the missing addend of 10, using manipulatives to solve the equation. Students will record the equation on the recording sheet. Print out and laminate the donut mats and the donut manipulatives (donut manipulatives may be easier for the children to manipulate, if a small piece of foam is glued to the back of each one). Students will choose a card and use the donuts to complete the addition problems. Students will complete the extension activity, by recording the numerical addition sentence solved. 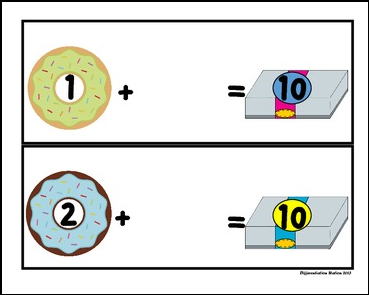 If you loved "Devouring Donuts: Number Line 0-20, Subtraction, Active Learning", you need to take a look at these games and activities! Bundle of Donuts! Addition, Subtraction, Number Lines, Games, and Printables. Delicious Donuts: Addition to 20, Number Lines, Missing Addends, and More!. Monster Munch: Addition to 20, Number Lines, Missing Addends, and More!.